1x01 - Pilot - Your Source for HQ Dan/Blair Clips! Your Source for HQ Dan/Blair Clips! Blair sees the Gossip Girl blast about Serena coming home from boarding school, and later gets scolded by Eleanor about the way she's dressed. Blair "borrows" Nate from his father; Chuck offers Nate some weed but he rejects it; Blair shoves Nate into the bedroom and tells him she wants to finally lose her virginity to him. 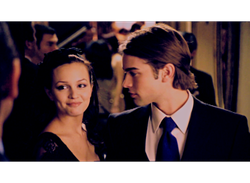 Blair tells Nate she'll always love him - then they hear that Serena's just arrived, and Nate takes off to go say hi. Serena and Nate are awkward; Blair notices and then gives her a hug; Serena bolts out of there with some excuse; Blair pretends like she knew Serena was coming back all along when Kati and Iz ask her. Blair thanks Jenny for doing the calligraphy on the Kiss on the Lips invitations and gives her one; Serena shows up and Blair tells her she's not invited, to the dismay of Little J; then everyone leaves Serena on the steps after she and Blair agree to meet for drinks that night. Blair and Serena discuss their family problems and decide to forgive each other for the hurt they've caused; Blair leaves for her date with Nate, leaving Serena to drink alone. Blair tries to seduce Nate the second he walks in, but he rejects her, claiming he has something he thinks he needs to tell her. Blair asks if Nate and Serena just kissed; his silence pretty much says it all. She freaks out and kicks him out, while we see a montage of Serena/Nate sexytime flashbacks interspersed with Serena kneeing Chuck in the groin as he sexually assaults her in present-time, and Blair crying alone in her room. Nate wins Blair back at dinner by telling her he'll never speak to Serena again. Blair acts like she's totally over what happened and leaves the table, obviously to throw up her dinner. Blair gets ready for the Kiss on the Lips party, and Eleanor comes in to give her fashion advice that just leaves Blair feeling miserable. The kids go nuts pre-gaming in the limo for the party, but eventually Blair and Nate stop participating in the shenanigans and just sit there sulking. Blair, Nate and the crew arrive at the party. Blair and Nate fight about Serena showing up, and Nate walks off, ignoring Serena; Blair glares angrily at her and storms out.